Butternut squash is absolutely my favorite crop to grow. I use it to make risotto, which is awesome, and spaetzle, which is awesome, and butternut squash soup, which is pretty good too. It is a superfood, very healthy for you, full of antioxidants and fiber… and best of all for a gardener it has a shelf left measured in months, as in more than 6. No need to eat it twice a day for 3 weeks when the harvest comes in, it’ll sit good on your pantry shelf until the asparagus is up the following year. I’ve had problems in the past dealing with powdery mildew on my plants, as in every year. It doesn’t stop me from getting yield, but it certainly reduces my yield, and that really annoys me. This year I planted two PMR (powdery mildew resistant) varieties for the first time. I purchased two varieties from Johnny’s Select Seeds, PMR Metro, and PMR JWS 6823. I planted them in various areas of my yard, along with some standard waltham butternut. I did not have nearly as much powdery mildew this year and in years previous, though all plants still eventually became infected. I think a lot of it was from the drought, fungal infections do not spread very well in dry environments, but once we did finally get some rain I did get infections. 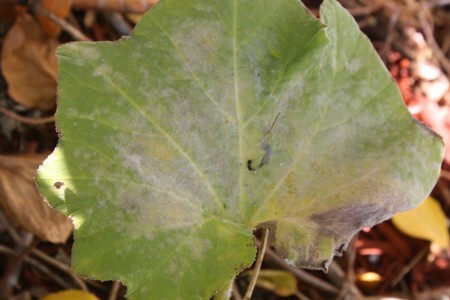 Normally the mildew progresses very quickly, killing leaves before the plant can replace them. On the PMR varieties this was not the case, they got infected, but it progressed very slowly, both along the plant and on individual leaves. Normally when a leaf is infected it’d go from fine to almost completely covered in the course of a day. With these new varieties it had problems conquering the entire leaf surface and I was more likely to see isolated spots. Of the two I planted, JWS 6823 performed better and would be the one I recommend. I’ve tried other things in the past to control powdery mildew. Neem oil is supposed to help, and I continue to try it, but I don’t exactly run controlled experiments and it doesn’t seem to work for me. I’ve tried organic antifungal sprays (sulfur based) and they seem like they might work, a little bit, but the fungus conquers all eventually. I of course try to remove old plant growth in the fall, but that is hard. My growing season is so short in Michigan I often do not have the opportunity to pull the plants prior to the first frost (because squash are still maturing), and once they have been frosted the plants are so falling apart it is impossible to remove them without shedding leaf material and spores, and I cringe when I see the spores come off the plants onto the soil, but it is unavoidable. I could practice crop rotation and stop planting the squash in the same place year after year, but I simply do not have enough room anywhere else in my yard to plant them. Sometimes, early on, once I see infected leaves, I’ll prune them and trash them to try to head it off, and that can work, but not reliably, because often the fungus will be under leaves where I can’t see. I think systemic fungicides would be the best control, but I’m not sure of any that are to be used on squash or other food crops. But I did definitely notice a benefit from using these PMR varieties, and I will be planting JWS 6823 next year. I also love butternut squash, and grew a few plants this year. My fruit wasn’t as big as I’d hoped, I think because of fungus as well. I used a mixture of baking soda and water, and it worked really well and really quickly. Next year try baking soda — I’m sure it’s the cheapest option, too. How much more productive were the PMR varieties? Were the squash as large? Not as large Sarah, the JWS was close though, Metro was significantly smaller. I don’t know if its fair to judge yield per plant, they weren’t growing in the same location. This year I got the most from JWS, it got more sun than where I had the regular waltham butternuts planted though. I would think that all other things being equal, the mildew resistance would create more yield on the JWS, but my garden simply isn’t big enough to do proper controlled experiment. I’m glad I found your article. I have the same problem although I didn’t realize it was a fungus. I thought it was due to the clorine in our city water. But I guess when I think back it was only the squash that showed this powdery stuff. I still had good sized pumpkins and winter squash. I have some seeds that someone gave me for a butternut squash with a hooked neck. It produces in an amazing way throughout the season without any powdery mildew. I am wondering if it has a resistance to it?? I would love to know the name of it. Do you have any idea? I’ve read that you can use the herb horsetail to make a spray for powdery mildew, but a friend told me he just makes a spray with garlic. I can’t wait to try them both. I had the same problem with my squash plants this year, but it happened very gradually and I was still able to get tons of squash. My pumpkin vines on the other hand, never had a chance. Not sure it was the exact same thing, but they got all white and powdery. Very fustrating, only got 1 or 2 small pumpkins before the vine died. Try using full cream milk – it is very effective, diluted to about one in two or even down to one in ten and used as a spray, depending on how bad the infection. You must use ‘full cream’ milk, not reduced fat or homogenised milk. It is the fat that is deadly on the fungal spores. That’s how we do it Australia. I just read your post about burning the tilled soil in the spring before planting. Could you do this after the first frost to your little squash area to get rid of the left over fungus material? In theory Stormi, but my squash I grow all over, including in my front yard, and I let it ramble amongst permanently planted trees and whatnot. If I was merely growing it in a dedicated bed I could. But I’d have to burn most of my front yard as is.